The end of a week, especially the period of time between Friday evening and Monday morning. 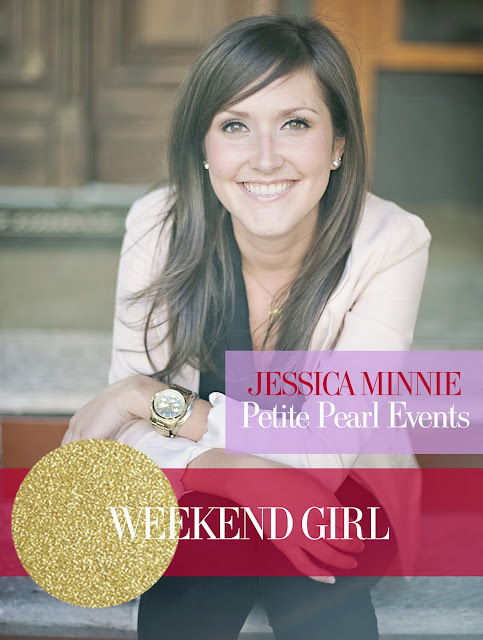 There's no better candidate to feature during the month of love than the wonderful Jessica Minnie from Petite Pearl Events A.K.A. Wedding Planner Extraordinaire! When you're in the business of love you have to have the perfect balance of sugar and spice. Raised in the small town of Prince George Jessica is one of the sweetest, kind hearted girls we know but when it comes down to business she's as savvy and serious as any power woman. She knows what she wants and is not about to let anything stand in her way. When planning a new wedding she thrives off the adventure of a new event and will go above and beyond to exceed all expectations, hopes, and dreams. Nothing is too far fetched, too elaborate, or too time consuming - she can always 'make it happen'. With Jessica's zest for life, unwavering character, and creative passion the only place to go is up. We're thrilled to have her as our newest Weekend Girl - a Vancouver powerhouse in the industry of love and laughter!